University Of Iowa Press, 9781609386061, 240pp. Since the 1980s, poets in Canada and the U.S. have increasingly turned away from the use of English, bringing multiple languages into dialogue—and into conflict—in their work. This growing but under-studied body of writing differs from previous forms of multilingual poetry. While modernist poets offered multilingual displays of literary refinement, contemporary translingual poetries speak to and are informed by feminist, anti-racist, immigrant rights, and Indigenous sovereignty movements. Although some translingual poems have entered Chicanx, Latinx, Asian American, and Indigenous literary canons, translingual poetry has not yet been studied as a cohesive body of writing. The first book-length study on the subject, Translingual Poetics argues for an urgent rethinking of Canada and the U.S.’s multiculturalist myths. Dowling demonstrates that rising multilingualism in both countries is understood as new and as an effect of cultural shifts toward multiculturalism and globalization. This view conceals the continent’s original Indigenous multilingualism and the ongoing violence of its dismantling. It also naturalizes English as traditional, proper, and, ironically, native. 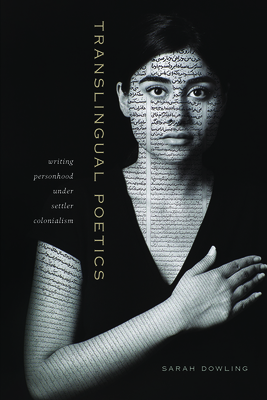 Reading a range of poets whose work contests this “settler monolingualism”—Jordan Abel, Layli Long Soldier, Myung Mi Kim, Guillermo Gómez-Peña, M. NourbeSe Philip, Rachel Zolf, Cecilia Vicuña, and others—Dowling argues that translingual poetry documents the flexible forms of racialization innovated by North American settler colonialisms. Combining deft close readings of poetry with innovative analyses of media, film, and government documents, Dowling shows that translingual poetry’s avoidance of authentic, personal speech reveals the differential forms of personhood and non-personhood imposed upon the settler, the native, and the alien. Sarah Dowling is the author of two books of poetry, DOWN and Security Posture. Dowling is assistant professor at the Centre for Comparative Literature and Victoria College at the University of Toronto.